Checking in with Chelsea Video Series Wins Telly Awards! The Checking in with Chelsea video web series was the winner of two Telly awards. Our Checking in with Chelsea video web series earned national recognition in its first year of production when it was chosen to receive two 2015 Telly Awards! The online series of DIY videos is hosted by Chelsea Lipford Wolf and produced and directed by Brad Rodgers. 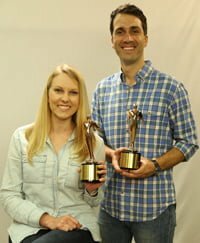 Chelsea and Brad with Telly Awards. The video series received Bronze Telly Awards for How-To/Instructional Web Show and Web Series. Founded in 1979, the Telly Awards honor outstanding work in video and film production. The 35th Annual Telly Awards received over 12,000 entries from all 50 states and five continents. The Checking in With Chelsea website, which hosts the video series, was launched in July 2015. The site currently has 40 videos and over 50 blog posts, with topics ranging from furniture refinishing and DIY craft projects to closet makeovers and decorative painting tips. A new installment of the video series is posted on the Checking in with Chelsea website the first day of each month. Chelsea Lipford Wolf is the daughter of home improvement expert and Today’s Homeowner TV and radio host, Danny Lipford. In addition to the Checking in with Chelsea website, you can also follow Chelsea on Facebook, Instagram, and Pinterest.